BENGHAZI, Libya (Reuters) - The U.S. ambassador to Libya and three embassy staff were killed in an attack on the Benghazi consulate and a safe house refuge, stormed by Islamist gunmen blaming America for a film they said insulted the Prophet Mohammad. Gunmen had attacked and set fire to the U.S. consulate in the eastern city of Benghazi, the cradle of last year's uprising against Muammar Gaddafi's 42-year rule, late on Tuesday evening as another assault was mounted on the U.S. embassy in Cairo. 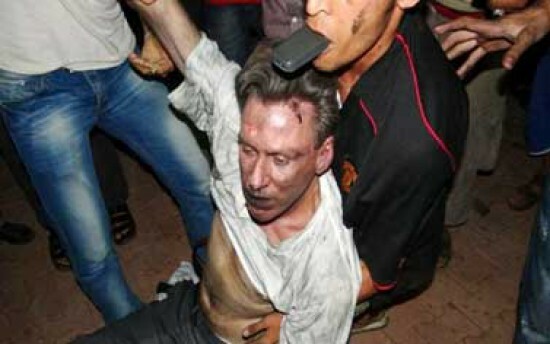 California-born ambassador Christopher Stevens was killed in the assault, but it was not clear how or where he died. U.S. consular staff were rushed to a safe house after the initial attack, Libya's Deputy Interior Minister Wanis Al-Sharif said. An evacuation plane with U.S. commandos units then arrived from Tripoli to evacuate them from the house. "It was supposed to be a secret place and we were surprised the armed groups knew about it. There was shooting," Sharif said. Two U.S. personnel were killed there, he said. Two other people were killed at the main consular building and between 12 and 17 wounded.